Recounts the decades-long saga of the New Jersey seaside town plagued by childhood cancers caused by air and water pollution due to the indiscriminate dumping of toxic chemicals. "..surely a new classic of science reporting"
Through the benefices of the Goodreads giveaway program, I enjoyed the great good fortune of receiving a free copy of Dan Fagin's landmark exploration of a fascinating example of the toxic effects of the byproducts of corporate activities on the the people who make their lives in the vicinity of those activities. The quality and depth of Fagin's journalism in Tom's River meets the highest standards; one would expect no less from a Pulitzer Prize winner. I think it bears pointing out that what distinguishes Tom's River as a historic achievement is not Fagin's exemplary skill in providing readers with a clear and compelling account of a tremendously complex and unfamiliar topic; rather, it is my strong view that Fagin has written a book of tremendous social and political importance that speaks to issues central to contemporary life in our country on an unprecedented level. The particular subject of the book is cancer clustering in the wake of long-term business practices that ultimately result in a toxic environmental effect in the vicinity of the community of Tom's River, New Jersey. I found this read truly inspiring. That said, it's worth noting that the problems faced by the people of Tom's River have long inspired my passionate interest; I hope to invest myself personally and professionally in addressing some of these particular issues. So, while this is a brilliantly crafted, important book for all fellow citizens to read, I admit I am not sure how fascinating, let alone deeply moving, the material will be. I am confident it will hold your attention throughout and engage your sympathies; Fagin's writing is well-tuned to effect these ends. --the incompetence of government and industry systems to effectively grapple with major effects of complex causation regardless of the best intentions upon discovery of those effects. Fagin's subtitle is a little misleading: In the end, there was no salvation for the families of Toms River, N.J., who suspected but ultimately were unable to prove without a doubt that environmental pollution from two large chemical manufacturers were responsible for a cluster of childhood cancers in their town. But science there is plenty, as Fagin painstakingly explores the evolution of our understanding of health hazards caused by exposure to chemicals and other environmental toxins. To explain the issues involved, Fagin moves back and forth across the centuries to trace the evolution both of the study of what causes disease and the discovery and development of man-made dyes extracted from coal tar and other noxious substances, all of which required copious amounts of extremely dangerous chemicals to separate the gooey sludge into its component elements that could then be processed into dyes and plastics. From the standpoint of the 21st century it is horrifying to read how cavalierly these early chemical manufacturers treated the toxic waste that their manufacturing processes produced, generally dumping it into the nearest river or pouring it out on the ground. The problem, of course, was that no one knew the health hazards of exposure to these chemicals and even fewer people cared. And as the science improved, and the toxic implications became more clear, the drive for profits invariably triumphed over hazard mitigation. I went into this book expecting to learn more about a big bad evildoer. But what I learned is that there was no one big evil entity in Toms River; rather, there were a whole lot of smaller evils working together to protect their own interests at a tragic cost to the citizens of Toms River. Sure, the two chemical companies who dumped most of the hazardous waste were to blame, but so was the local water utility, who conspired with the polluters to cover up proven contamination of the town's water supply because they worried about being able to meet the city's demands for water if they shut down the affected wells. And the local, state, and federal regulatory agencies who were meant to ensure that industry complied with safe disposal requirements were unwilling and unable to enforce their own rules, generally choosing to impose token fines or no punishment at all even when a company was caught polluting red-handed. And the people of Toms River bear some responsibility themselves: There were signs of potential problems with pollution but city officials looked the other way. They and the workers themselves were unwilling to risk angering the area's largest private employer, where blue-collar jobs were plentiful and paid good wages. In the end, the catalyst to force local and state regulators to take seriously the existence of a cluster of childhood cancers caused by environmental pollution was a woman whose son was born with brain cancer (I honestly had no idea such a thing was even possible, and I found it a horrifying thing to contemplate). She gradually became convinced that her son and many other children had been hurt by contaminated water, and she gathered together the parents of other cancer-stricken children to demand answers. Unfortunately, even once the forces of epidemiology were unleashed, answers were thin on the ground. Even after years and years and millions of dollars spent on water testing, case studies, and testing of potential carcinogens in animal studies, science ultimately could not prove that contaminated water caused the cluster of childhood cancers in Toms River. It was a frustrating conclusion, but Fagin did an excellent job of showing just how limited the science is into what causes cancer, and how hard it is to detect clusters of cancer in residential areas, even now in the 2010s. Fagin is careful to present the research results without bias, which makes it clear that while there was almost certainly a correlation between exposure to the tainted water supply and childhood cancer, no test or study was ever able to create a definitive causal link. I received bound uncorrected proofs of Toms River, by Dan Fagin, from the publisher through the LT Early Reviewer program, and the review is based on that copy. This book caught my interest because I used to live in South Jersey. It held my interest because the author really can write. Fagin took a story filled with complex issues and made it understandable and compelling. He even made the scientific stuff interesting and comprehensible for me, and I am NOT a science person. This is not a happy book -- what book is that deals with toxic waste and cancer? But I think it's an important book, telling an important story and dealing with important issues. Toms River is named for Toms River, NJ. In the 1950's, a Swiss-owned chemical company built a plant on a large tract of land on the edge of town. It became the biggest employer in town; company officials were highly visible and influential in community civic functions. The plant would also eventually become a major EPA Superfund clean-up site. At another location near town, toxic waste from another chemical company was dumped -- another Superfund site in the making. And, over the years, area residents began noticing an unusual number of pediatric cancer cases. The main thread of the book is the story of how chemical waste was (mis) handled by Toms River Chemical and others who disposed of toxic chemicals in the area, of the growing concern over kids with cancer, and of residents' fight to prove that the cancers were linked to the toxic waste. As background, the reader learns some history about the chemical industry and related environmental issues (especially regarding dyes, which were the primary product of Toms River Chemical when it opened). There is also information regarding the history of epidemiology, and its eventual use in matters of industrial medicine. While the scientific and historic information was more plentiful than I'd expected, I found it helpful for understanding the issues at stake, and quite interesting to read. But it's in the narrative of what happened at the chemical plant and other contaminated sites, and of the fight to confront the mess and its possible consequences, that the heart of the book lies. When I was younger, we visited friends of my parents who lived in Toms River. After the visit, we went either to my grandmother’s sister in Absecon or to my grandfather’s brother in Jersey City or to his summer home in Sea Girt. At about the time my Uncle Dave retired and my aunt’s husband died, necessitating her move to a retirement community, we no longer went to Toms River. However the time of the visits coincided with the beginning of Dan Fagin’s story in Toms River : a story of science and salvation. Although I have never gone back to Toms River, it still holds a special place in my childhood. The book tells the story of one town, an industrial complex, politics and pollution of water and air. When Ciba began its plant in the early 1950’s and began their dye business, there was available land and a nearby river emptying into the ocean into which wastes could be placed without the state being concerned. The town drew its drinking water from municipal wells although some did have their own well supply of water. The population grew and so did the plant, even transferring workers from other locations. Within its boundaries, they had lots of land. What they didn’t dump into the river, they buried in their land. At the same time, a local farm allowed another chemical company’s waste to be buried on the site. Fast forward and factory workers were getting ill. But even more alarming, the incidence of childhood cancers was well above the averages for the rest of the state. Fagin weaves together the narrative of the town and factory, the politicians and sick children, the investigators and the regulators with a history of chemistry and of cancer research, especially epidemiology. It’s not a pretty story but it needed to be told, if only to warn the world that this cancer clustering is happening again, especially in places like China and other developing countries with lax regulations for hazardous chemicals. The book is meticulously footnoted although there is no separate bibliography. (There is also supplemental material in the endnote section which is more technical in nature than the main text and can be disregarded for the casual reader.) There is a map of Toms River, needed to see the proximity of the plant and the Reich farm to the water supply of the town. I most missed the index which will be available in the final copy of the book. I found that I wanted to check back on some facts and had to flip though the book to find the sections I wanted to re-read. Finally there is a list of all the people who were interviewed for the book, an impressive list. With a degree in chemistry, I have read many popular books on the topic and this is one of the better ones. This big book is journalism and storytelling at its best! Pigments to produce Tyrian purple were so rare the color signified royalty. That changed in 1856 when eighteen-year-old chemistry student William Henry Perkin discovered how to produce aniline dyes from coal tar. Alexander Clavel and Johann Rudolf Geigy-Gemuseus then quickly learned the secrets of producing useful chemicals from coal tar and began manufacturing various chemicals in Basel Switzerland. Others followed and chemical manufacturing companies named Geigy, Bayer, Hoechst, Agfa, BASF, and Ciba began to thrive. However, this remarkably profitable business generated far more toxic waste than useful product. After moving from the banks of the Rhine to Cincinnati, Ohio, Ciba finally found a quiet two-square-mile area where their manufacturing could continue unfettered in the forest. In 1952 Toms River welcomed the Ciba Chemical Company to their small Jersey Shore town. The plant was producing five million gallons of wastewater by the 1970s. At the same time they were burying nearly 10,000 drums of waste each year in various pine-covered regions of their property, and elsewhere. The Toms River Water Company supplied the entire township from a shallow well two miles downstream from the chemical plant. When the wastewater overwhelmed the tiny Toms River, the chemical company built a 28-inch diameter, 10-mile-long pipeline to discharge waste directly into the ocean. Eventually there were stories about people working in the plant who got cancer. The wealthy throw out what they do not want, the poor scavenge what they can, and the remainder is left to rot. The people of Toms River were becoming sick. Practically every long term employee knew someone who died of cancer. Children became sick, and several died. Certainly the chemical plant was to blame. What might be the cause of the cancer deaths that plagued the town? Extraordinary efforts by extraordinary people involved the community, health care workers, government agencies, regulators, experts, environmentalists, journalists, politicians, and eventually lawyers in an unprecedented investigation of what happened. Serendipity, tenacity, heroism, politics, money, emotions, data, ignorance, persuasion, cooperation, and conflict all played their vial roles. This is an excellent, well researched book about the effects of on the town of Tom's River, NJ of the pollution produced by the Ciba-Geigy chemical company and then dumped into the town's water supply. It's also probably one of the most depressing books I've ever read. For over 100 years the Swiss company dumped its industrial wastes into rivers first in Europe and then in America. Whenever government authorities discovered how the company was poisoning water supplies, thtey would just move to another location where they would be welcomed for bringing in needed employment and most government officials would turn a blind eye to how they were disposing of their industrial wastes. If not for some brae individuals who were not afraid to speak up, and to generally be a thorn in the side of both the company and the government (who both hoped they would shut up & go away),nothing would be done to stop the chemical companies from fouling the water supplies of hundreds of thousands of people. And even after attention started to be paid, it was incredibly hard to prove that the chemical companies were guilty. After a law suit was filed, and settled out of court, the chemical companies simply abandoned Tom's River, for more profitable off-shore locations and to day are happily polluting the water supplies in China. Today is the publication date for this impressive nonfiction book from Bantam. I read it weeks ago but had to wait until today to post my review. You may have lived in New Jersey in the 1980s (as we did) and therefore have heard about the cancer cluster in Tom's River, or it may have made the New York newspapers. By now the basic facts are an old story unfortunately repeated in many other parts of our country and abroad. The mother of a boy with cancer started hearing about other children who had it. She put up a map of the Brick Township area of which Tom's River is a part, and she began to put a push-pin at every home where she heard of a case of childhood cancer. It didn't take very long before that map had so many pins it was shocking. Rather than just sit on this knowledge, she began to campaign for the state, or someone, to investigate what could be causing this phenomenon that looked like an epidemic to her. In a wooded area of the township hidden away from prying eyes was a Ciba-Geigy facility making dyes. The processes used produced toxic waste which they disposed of in open pits or the river, Tom's River. They burned other waste at night when the black smoke and putrid smell would be less noticeable. Meanwhile, the toxic waste simply ate away the tarp covering the bottom of the pits and proceeded to filter down through the sandy soil to the aquifer. That part of New Jersey is called the Pine Barrens. It is known for its sandy soil and the aquifer which is one of the most valuable assets of the state. That plume of toxins got bigger and bigger until it entered the aquifer where the town of Tom's River had its water wells. Now many of the people who lived there, including Ciba-Geigy employees, were drinking tainted water. Did that cause the cancer cluster? Fagin's book is the long story of the fight to instigate an investigation, the pollution that was going on, the reluctance of the chemical employees to complain about anything because the jobs were needed so badly, and the children who contracted cancer many of whom died. This is a long book because it's a long story, but also because Fagin traces back dye making to its beginnings in Europe and he also traces back the history of dumping toxic waste. Sound boring? Couldn't be farther from it. This is a fascinating, if upsetting book that I read slowly to make sure I could retain it all. Doesn't matter if you don't know or even like science (like me) because Fagin explains everything so that anyone can understand. When I received this book I was not in the mood to read about chemical companies' complete disregard for anything but profits or pollution or cancer. However, it immediately drew me in and I read 134 pages in the first sitting. I've also been compelled to tell everyone I'm in contact with about it. Fagin's writing and structuring is particularly effective in keeping the book lively and interesting and preventing it from becoming overwhelming. He shifts between the specific history of Toms River, of the plant, its employees, and the citizens, and the history of industrial waste disposal, environmental safeguards, and the history of epidemiology, cancer, cancer treatments and research. The background feeds directly into the issues in Toms River, and each section seemed necessary. While I find science interesting, it's certainly not specialist subject, but I didn't feel overwhelmed by the information presented. Fagin writes very clearly, and seems to keep the general audience in mind. For instance, if an acronym hasn't been used for a while he reminds you what it stands for (a move I greatly appreciate). There is a real balance in this book, both in the information reported (epidemiology is rarely completely obvious and solid) and between telling the scientific story and the human story. Superbly written, monumental story, fast read. Winner of the Pulitzer Prize. 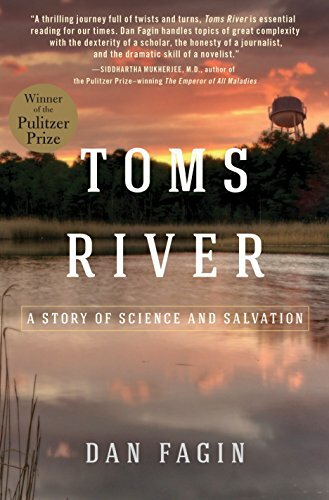 Tom's River is a meticulously researched thoroughly engrossing book about the consequences of industrial pollution. It's also scary as hell. I began the book thinking that it was a great cautionary tale that thankfully wasn't in my back yard. But oh no, just a few pages in it turns out this New Jersey nightmare started in Cincinnati. Suddenly it was a lot more personal. What's in my water? A gripping, terrifying true account of a corporate-made environmental and public health catastrophe, aided and abetted by the willful ignorance of local government. An exemplary work of research and reporting.